Description: Collect the required resources to get Aurora, Heaven Hunter, Hellish Wolf and Pegasus to fight with you, and many other rare items! 2. Players can gain points by collecting Grotto Heart, while Refining Stone, Spring of Wisdom and Element Crystal are not counted this time. 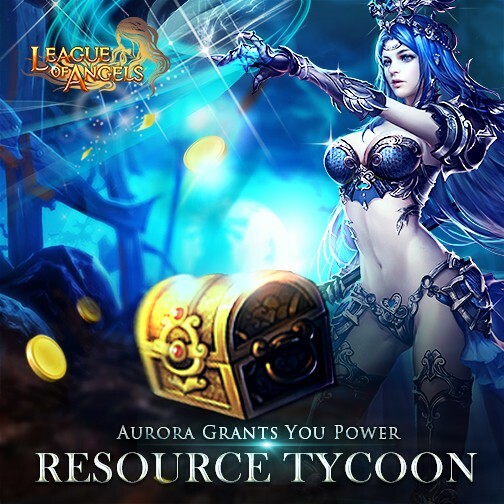 Moreover, you can obtain more resources in Time-limited Resource Sale at a lower price than ever before, thus it will be much easier for you to gain more points. 3.Tycoon Daily Points is newly added in CS Resource Tycoon. Reach certain points and you can claim your rewards EVERY DAY. And by completing certain tasks and you can get corresponding diamonds back! The Tycoon Period Rewards is no longer available in CS Resource Tycoon. 4.Check the newly added ONCE TYCOON. Players can claim EXTRA REWARDS after meeting certain requirements; rewards including Dark Grail, Spiritsoul Melody, Eudaemon Ring, Spirit Essence, Divine Emblem, 5-star Khaos Angel Chest 5-star Khaos Hero Card. Check "Once Tycoon" out in Hot Events! 5.There will be Time-limited Resources on sale EVERY DAY during the event! Don't forget to check them out in Hot Events! You can gain more resources at a lower price than before! - Players can gain points by collecting required resources during the event, i.e. Grotto Heart, Angel Tears, Element Scroll, Runestone, Blessed Stone, Seraph's Stone, Aegis Shard, Soulstone, Gold, Enchanted Stone, Gems and Gem Enhancement Stone. Description: Have fun in Tycoon! Use Bloody Dancer Crest to exchange for Heavenly Storm and more resources. Description: Have fun in Tycoon! Spend certain diamonds to get Blade Dancer Miya! Description: Have fun in Tycoon! Get 3000KTycoon points to collect your favorite item! Note: you can only choose one of the rewards. More exciting events are coming up through May 18 to May 26 (server time), check them out in the in-game Hot Events menu now!